For tonight’s post, I’m pulled out some more unprocessed raw files from our last trip to Jerome. There are a lot of abandoned vehicles on display at the Gold King Mine ghost town. Some look like they probably still run, others are obviously junkers. They all probably have some great stories hidden beneath the rust and buried in the upholstery. This shot is a small sample of the collection of old trucks, cars, buses, vans, motorcycles and heavy machinery they have scattered around the property. This entry was posted in Processing, Shooting and tagged abandoned, Arizona, AZ, camera, car, D700, dirty, dusty, Gold King Mine, HDR, Jerome, Nikon, Paint Shop Pro, photography, Photomatix, red, Topaz, truck. Bookmark the permalink. I can’t believe I paid so little attention to the vehicles around this place. Distracted by chickens I guess. Great shot! Excellent blog. My best friend has one you might really enjoy from AZ. 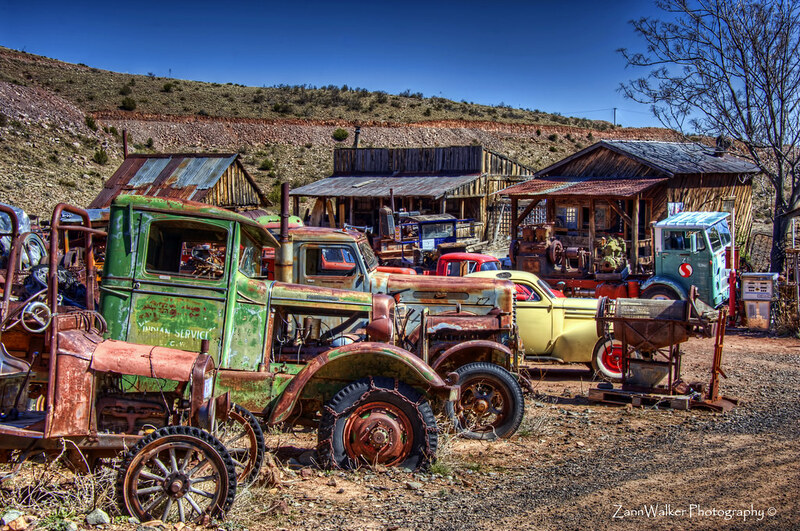 I just got back from a trip to Jerome and FELL IN LOVE with the whole town – and the King Mine junkyard? There was not enough time to see it all! I love this image – you did a great job!